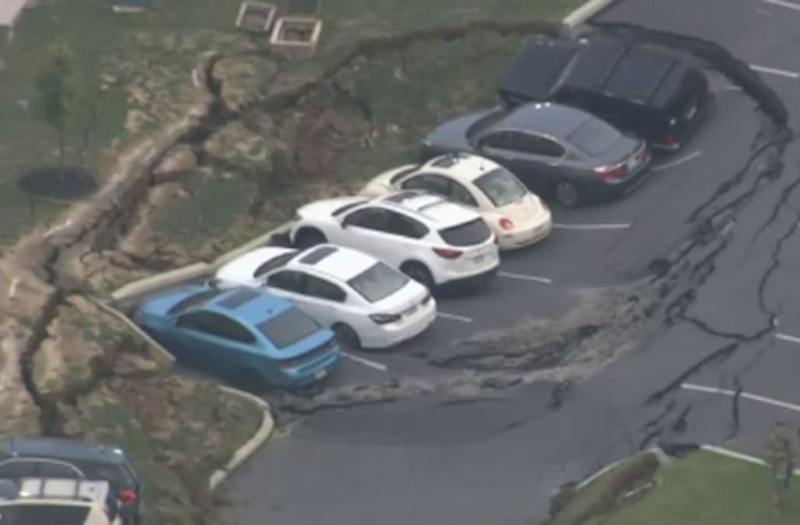 EAST LAMPETER TOWNSHIP, LANCASTER COUNTY, Pa. (WPMT) -- A sinkhole that opened up at a Tanger Outlets parking lot in Lancaster County on Friday, has left some of its shoppers in a tough spot. A few of those whose cars were swallowed in, are now looking at pricey repairs. The sinkhole, which took more than half a dozen vehicles with it, put tow, crane and other emergency crews right in the center of it all to help get them out overnight. “As our recovery operators were down in the sinkhole rigging the vehicles to be recovered we had ground falling and collapsing around us while we were in the sinkhole," said Wayne McDade. Wayne McDade with Wayne's Towing & Recovery in Lancaster County, says while most vehicles only had minor damage, others weren’t as lucky. “Some of the vehicles sustained damage that would prevent them from being driven," said McDade. Kathi LaNasa of York was back to school shopping with her son when they saw what she says seemed like a scene out of a movie. “My son said oh my gosh what’s going on over there it looks like a sinkhole and I said oh my gosh we parked over there," said LaNasa. “There was nothing under my back tires and the middle of my car was teetering," she added. Which left her car with some serious damage after it was finally pulled out of the sinkhole. “My vehicle doesn’t have brakes anymore," said LaNasa. LaNasa says her exhaust is also damaged and will need to be repaired. Doors remained open at the outlets, however after seeing what happened, some shoppers were wary to park near the gated sinkhole area. "We parked here to go look at it and then I’m like we’re not staying here because I don’t know if it’s going to expand, we don’t feel safe here," said Maria Brady, shopper. “As bad as this situation was, it could have been so much worse," said McDade. "There were no injuries, no loss of life," added McDade. LaNasa tells FOX43 Tanger Outlets provided her with a claim number and was told they would pay for the cost in damages, however FOX43 reached out to Tanger Outlets and they say they still in the process of figuring out what the next steps will be and that nothing has been determined at this point. A spokesperson with Tanger Outlets tells FOX43 the sinkhole is being monitored as it continues to expand. A construction crew is expected to be on site by Monday.